ChloeNoel Protective Hip Pad. This lightweight hip pad gives you protection from falls on the ice. Three-quarter inch thick and easy to use. Position it over your hip inside tights or leggings. 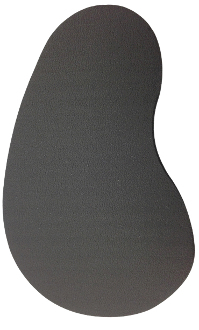 Made from flexible rubber foam, it is designed with the flexibility to be used on either side and to stay put while you are skating. Available is Small, Medium and Large sizes.